Exelon Corp. agreed to purchase the FitzPatrick nuclear plant for $110 million only after New York regulators agreed to subsidize the facility and two other Exelon nuclear plants to help the state achieve its carbon-reduction goals. Photo courtesy of Entergy Corp. The power industry has launched its first legal challenge against New York's ambitious renewable-energy program. NRG Energy Inc. and a group representing competitive power generators filed suit yesterday in federal court to block a key part of the state's Clean Energy Standard: its subsidies to nuclear power plants. They said the subsidies give nuclear an unfair leg up against other competitive generators and, in so doing, violate federal jurisdiction over wholesale power markets. In a complaint filed in the Southern District of New York, the companies asked the court to invalidate the nuclear part of the program. Audrey Zibelman, who chairs the state's Public Service Commission, said she's confident New York will win in court. "The frivolous lawsuit is right out of [the] fossil fuel industry's playbook to deny and thwart actions to combat climate change," she said in a statement. "The Supreme Court has repeatedly upheld the rights of states to protect their environment for the welfare [of] citizens." "To call it frivolous is to make light of it, which is unfortunate because it's a serious matter," said John Shelk, president and CEO of the Electric Power Supply Association, which is a plaintiff. "I wouldn't be surprised if it goes to the Supreme Court." New York regulators approved the CES in August, putting the state on track to get half its power from renewable energy by 2030. A critical, and controversial, part of that plan was to give subsidies to three nuclear power facilities to keep them open. Most imminently, the James A. FitzPatrick plant was slated to close by next year. Without these subsidies, Gov. Andrew Cuomo (D) said, the plants would shut down and the state would lose ground on its greenhouse gas goals. Keeping the nuclear and adding renewables would add less than $2 per month to the average residential power bill, officials said. 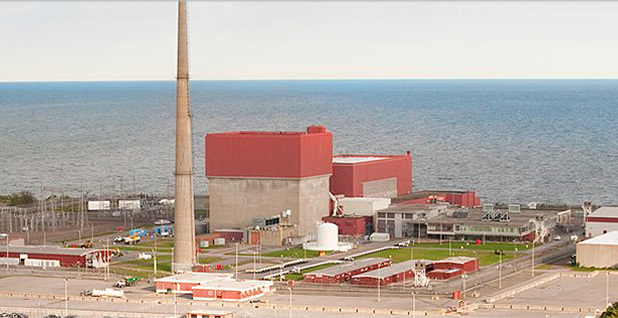 But critics, including environmental groups, said it amounted to a massive handout to Exelon Corp., which owns two of the state's nuclear facilities and is trying to buy FitzPatrick (EnergyWire, Sept. 6). "We believe that the plan will withstand legal scrutiny fairly easily," an Exelon official told E&ETV last month (OnPoint, Sept. 19). Still, observers had expected someone would raise a challenge that had to do with federal authority. The challenge yesterday has seven plaintiffs: NRG, which is the United States' largest independent power producer; Dynegy Inc.; Eastern Generation LLC; the Electric Power Supply Association; Roseton Generating LLC; Selkirk Cogeneration Partners LP; and a new group called the Coalition for Competitive Electricity. They said they represent generators of various kinds in New York, including gas and renewables. The challengers said the CES is supporting nuclear plants that cannot compete fairly on the open market. "Wholesale market price signals are indicating that these units should be retired," their complaint said. The next question is how courts will see it. In April, the Supreme Court overturned a Maryland policy that it said violated the Federal Energy Regulatory Commission's authority. The New York plaintiffs said that case, Hughes v. Talen Energy Marketing LLC, should also apply in New York. But New York officials said they designed the CES specifically to pass the Hughes test (EnergyWire, Aug. 19). For now, unless a court rules otherwise, the machinery of the CES can grind forward. New York can continue to implement the policy even while the suit is pending, according to the state's Department of Public Service. And Exelon can continue its transaction to buy the FitzPatrick plant, according to Shelk of the Electric Power Supply Association.